In this hands-on C++11, C++14 and C++17 training for professional C++ developers, you will learn the language changes and the standard library changes introduced in C++11, C++14 as well as changes from C++17. In class, the new standards will be demonstrated with the aid of many examples, and you will get the opportunity to use them right away in our lab projects. Since not every developer has a C++14 or C++17-capable compiler yet, features only available in C++14 or C++17 are clearly marked as such in the material. The training also teaches some advanced C++ features like variadic templates and perfect forwarding, but they are introduced gently, and some of them are optional. 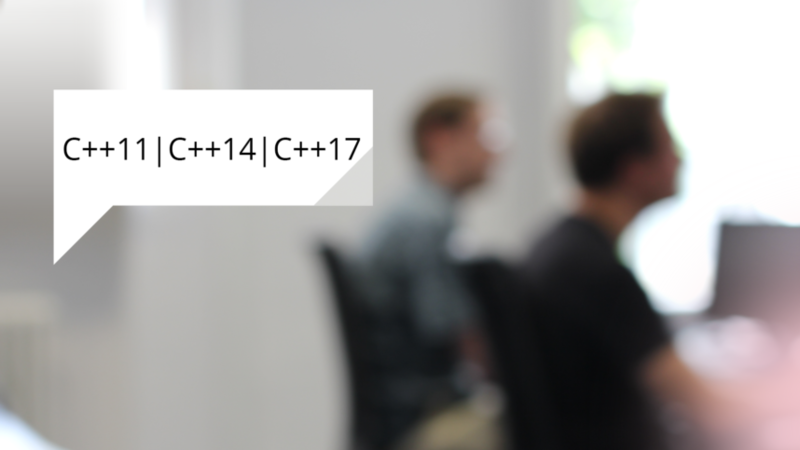 Why join our Modern C++: C++11 / C++14 / C++17 training? C++11 is a new major version of the C++ standard, released in 2011, and brings many new features to C++ that make the language safer, faster as well as easier and more fun to use. Every professional C++ developer will sooner or later come into contact with C++11/C++14/C++17 and introducing their advantages early can only be beneficial. Because of all the numerous changes, the C++ creator, Bjarne Stroustrup, said that “C++11 feels like a new language”. C++14 and C++17, released in 2014 and 2017 respectively, bring further incremental improvements. Prerequisite: Students are required to have basic C++ knowledge, for example knowing about inheritance and virtual functions. Sign up: Please check out course availability. Excellent presentation and instructor whose knowledge was exceptional. I have rarely had an instructor who had such a mastery of his course.